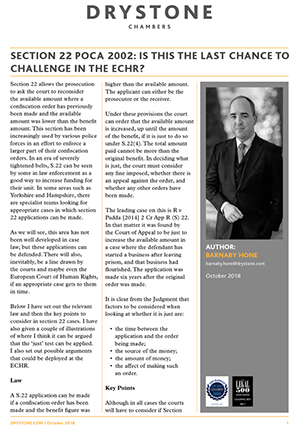 Barnaby Hone on section 22 POCA 2002: is this the last chance to challenge in the ECHR? The following article, part of a series authored by POCA and Financial Crime specialist Barnaby Hone, deals with the ever-more prevalent use of Section 22 POCA 2002. Section 22 allows the prosecution to ask the court to reconsider the available amount where a confiscation order has previously been made and the available amount was lower than the benefit amount. As prosecuting authorities face austerity cuts, the use of section 22 is only going increase as prosecuting authorities see it as a way of maximising revenue – this has meant some draconian and seemingly unfair awards against defendants: but how much longer will we be able to appeal to the ECHR?